This is the first of a short series of videos for those of you that have purchased Corel Draw. 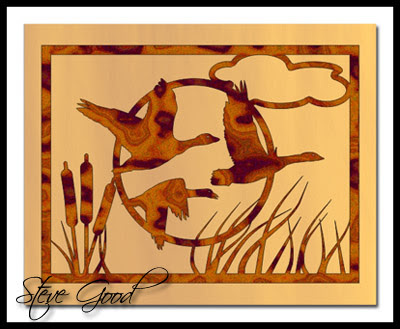 I will try to give you a basic foundation in the use of Draw for creating scroll saw patterns. This will not be a detailed set of tutorials. I only use a small set of the tools in Draw to design patterns. Those are the tools I will be teaching in this series. My goal is to bring you up to where I am with this program so you can more easily follow my other videos. If you have specific questions about Draw send them to me in an email and I'll try to cover them in a video if I can. 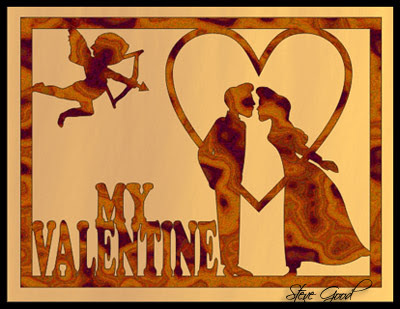 Here is a simple pattern that you can cut for your valentine. Holidays are great for scroll sawyers. Everyone is looking for a unique gift to give. 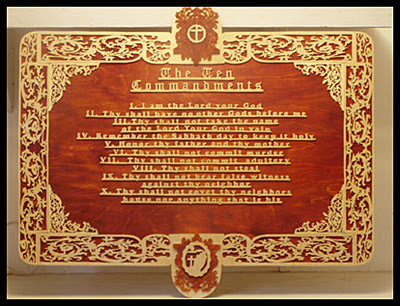 With a little scrap wood and some creativity you can make that unique gift that is one of a kind. Guys, I have been so busy lately that I am behind on replying to emails. If you have sent an email and not received an answer from me I'm sorry. I'll get caught up as soon as I can. I'm on vacation next week and should have more time. Thanks for the emails. I just wanted to share a video I found tonight. This is one of the coolest wooden toys I have seen. Check out the water ripples. Absolutely fascinating work. 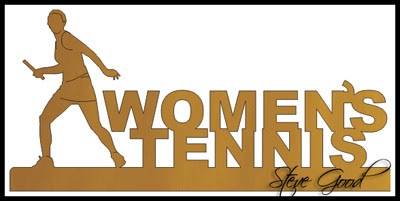 Here is a women's tennis plaque. I designed several sports trophies a while back. Someone asked for a tennis pattern and I never got around to it. I do keep a list of all the requests. Better late than never I guess. I keep getting email from readers asking for more videos on Corel Draw basics. I have tried to stay away from just doing a basic tools video because I thought there were plenty already available on the web. I have somewhat changed my mind and will do a few videos on just the basic tool and getting started with Corel Draw. 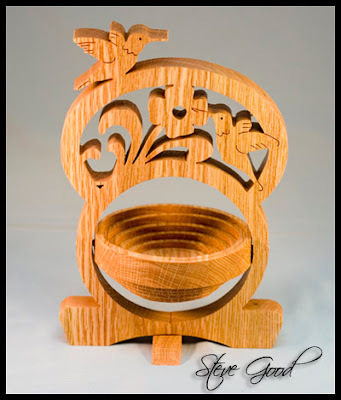 Look for these soon if you are interested in this area of scroll sawing. This collapsible basket pattern is made from 3/4" oak. These baskets are easy to make and look nice in almost any wood. To get the basket to collapse correctly you will set your scroll saw table to about 5 degrees. You should make test cuts in scrap wood until to get the angle correct for a fully open basket. The one in the photo above needs to open a little more. I used a #7 blade and the table was set to 5 degrees. 4 degrees might have been a better choice. Normally these baskets fold flat for storage. I made the outside of the bowl a little narrow which makes it a little difficult to get it to fold up. You need to round over the outer bowl so it will pivot freely. The video will give you some construction tips. 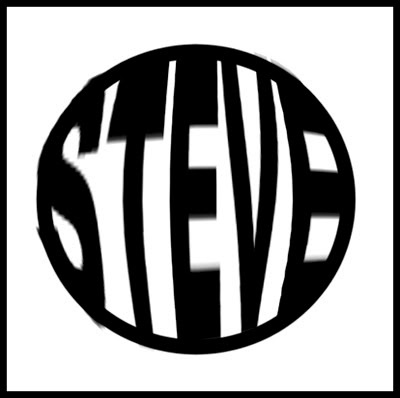 Steve I received my Corel Draw today and have updated the pattern I sent to you earlier. Your videos were a great help in creating this pattern, so keep up the good work. Feel free to share this on your site if you see fit. I have included the a PDF and Corel version to best suit your needs. This is just a simple modification to your old pattern which changes the theme of the design and makes it a tad bit bigger as requested by one of my buyers. Thanks again for you help and any recommendations would be gladly accepted. Hi Jeremiah, I don't have any recommendations. It already looks great. Thanks for sharing the pattern. Norm wanted to share another pattern with us. 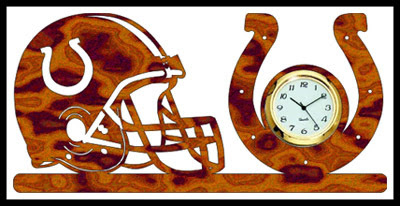 This clock is about 6" x 9". 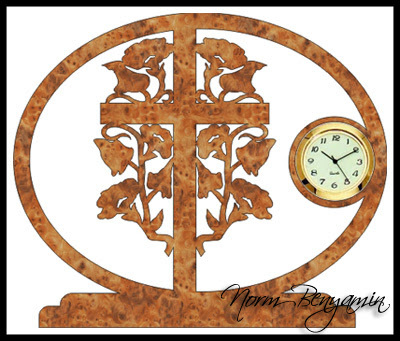 Norm has designed the clock for a 1 7/16 mini clock insert. 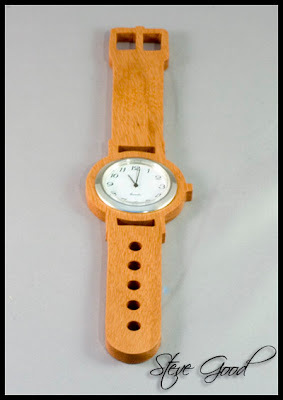 The pattern is big enough that you could modify it a little and install up to a 2 1/2" clock insert. Thanks for sharing Norm. Here is my latest creations--I've been working on this for quite some time. I'm rather proud of it. It measures approx 22 X 34. It is this project that I want to learn the clip art tracing for, because I want an entire self made creation for my next one. Diane, that is an absolutely beautiful piece of work. You should be proud of what you have done. Many of the readers here at the Scrollsaw Workshop are new to scrolling and this gives us all something to shoot for. Thanks for sharing. 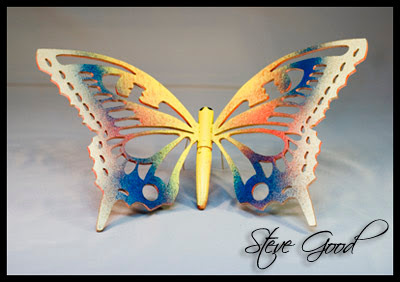 A good friend of the Scrollsaw Workshop, Norm Benjamin has donated another pattern to share with everyone. I don't think Norm has slept much since he got his copy of Corel Draw. Norm and I have emailed back and forth while as he has come up to speed. Thanks Norm, nice pattern. Several people have ask me if I could send them my videos so they can watch them from their hard drive. The files are so big that it's not possible for me to email them. This video is a tutorial of how to download the videos from YouTube. I have used aTube Catcher software for a couple months now. It works well for me and seems to be clean of spyware or adware. As with any software you download from the net you download and use this software at your own risk. This butterfly is 11" wide. I cut the wings from 1/8" baltic birch ply. The body is 1/2" dowel rod sanded to shape. The wings are inserted into small dados drilled into the body. Drill the wing dados at an angle so the wings are in the proper orientation. Hey guys and gals, I'm getting tons of emails with questions and comments. Thanks and keep them coming. Your email lets me know what you want to see. I try to answer every email but some fall through the cracks. Sorry if I don't answer your email but I do read every one. Now I owe what I have accomplished thus far all to you. You have been a great help and inspiration seeing what you do makes me want to be as good. Thank you so much. Oh, yes you can share this pattern if it's okay. I do not mind, I just had to see if I could do it. Dag gone Norm you could have at least struggled a little before you started making my patterns look bad. :) Great job. I may not get away with posting this pattern because of copyright issues. This pattern is for illustrative purposes only and should not be used in any commercial use. Norm has only been using Corel Draw for a very short time. 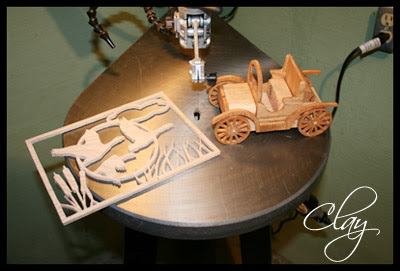 You can see from what he has accomplished that making patterns for your scroll saw is fun and easy. Give it a try. 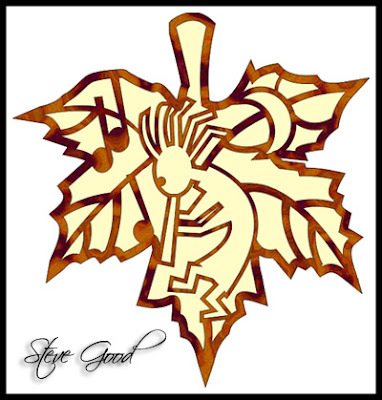 Kokopelli is a fertility deity, usually depicted as a humpbacked flute player, who has been venerated by some Native American cultures in the Southwestern United States. Like most fertility deities, Kokopelli presides over both childbirth and agriculture. He is also a trickster god and represents the spirit of music. This is just a fun pattern that I put together today. Hope you have some fun cutting it. It is about 8" x 8". Okay guys, you have about a month until Valentines day. 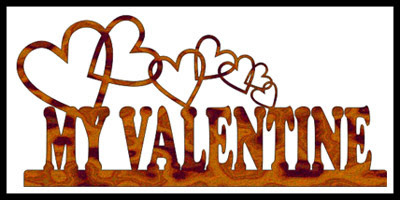 Make your lady a special wooden card. Buy her something special then give her this card. Get a gold ink marker and write how much you love her on the back. That might even keep you out of the dog house for a few days. Use contrasting woods or paint the backer board so the pictures stands out well. This card is 8.5" x 6.5". You could also build a simple frame so she could hang it on the wall. I'm sure you get millions of emails, so I'll try and ask little of you. I haven't been visiting your site for long--shame on me--and I JUST got Corel Draw. I'm so excited at its capabilities. 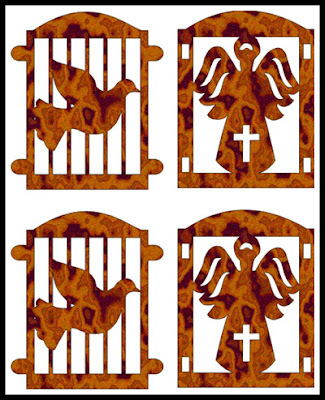 I know you have tons of videos, and I want to learn more about making clip art for fretwork. I just watched the video on the front page of your site. You mentioned using downloaded clip art but then having to trace the edges. I am somewhat understanding that, but have too many questions. Do you have a video explaining that? Your videos are WONDERFUL! You are a fine human for taking so much time for this project. I hope everyone donates nicely to you! Hi Diane, flattery will get you everywhere around here. I hope this video helps. Email from Clay. Clay is 15 and has only been scrolling for a week! I love your web site. Just to get the facts straight. I'm 15 and ever since I first saw your web site all I could think about about was scroll sawing. I've watched all your videos and visit it every day for any new things. The things Ive done haven't all come from your web site but it is still scroll sawing. Well Ive only been scrolling for a week and I don't think I'm to shabby if I do say so myself. Welcome to the Scrollsaw Workshop Clay. I have received hundreds of emails here but yours has me shaking my head. Your projects look great. If you have accomplished all this in a week I can't wait to see what you can do with a little more time. Thanks Clay you have made my day. Keep on scrolling. Sergio is a frequent visitor to the Scrollsaw Workshop. He is working with Corel Draw and learning to make scroll saw patterns. He keeps me posted with pictures of some of his projects. I wanted to share his latest work. When you have the ability to create custom patterns for your saw it opens up a whole new world. I'm sure the friends and family of Sergio will be thrilled to get these gifts. 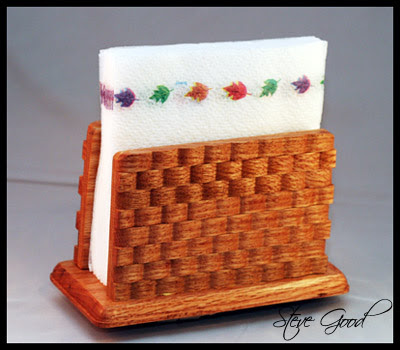 A simple napkin holder with a decorative basket weave pattern. 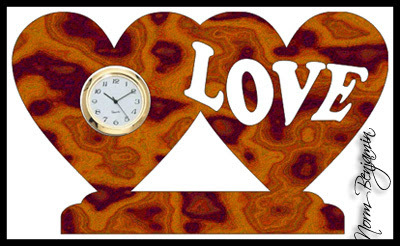 Several of you continue to email me about using Corel Draw to create scroll saw patterns. Tonight I cave put together another video that explains the technique I use to speed up my pattern making. Enjoy the video and let me know if you have any questions or requests. 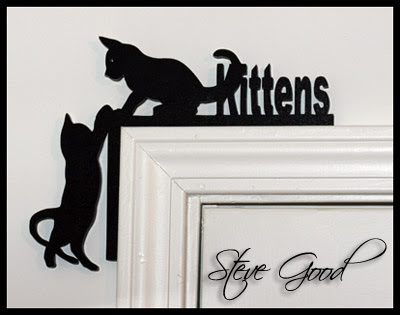 You can hang these playful kittens from the corner of a door or window. You could even put them on top of your computer monitor. I cut this pattern from 1/2" Baltics birch ply. A little black spray paint and they are ready to hang. Fun and quick little project for the cat lovers out there. This pattern makes a hand saw that is about 18" long. A good combination of contrasting woods is oak for the blade and walnut for the handles. If you need instructions for this project look in the archives for May 1st. I have a video showing how to make and assemble the saws. After I posted the email from Pat the other day I had several emails. 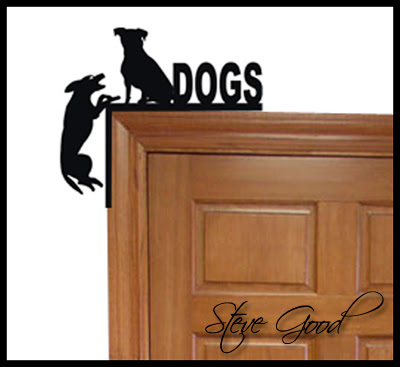 Readers were asking if Photoshop could be used instead of Corel Draw to make the ornaments. Well I asked several Photoshop gurus and they said it could not be done automatically. I spent a little time in Photoshop trying to come up with a way to do it manually. The video below shows what I came up with. It's not perfect but it's a place to start. Envelope tool in Corel Draw. After I posted the email from Pat the other day I received many emails about the ornaments he made. 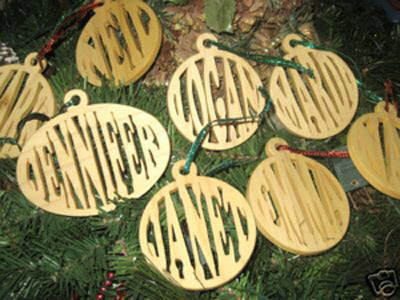 If you would like to make these ornaments and you have Corel Draw look for the video demonstration in the archives at August 9, 2007. The ornaments in the photos above were sent to me by Sergio. 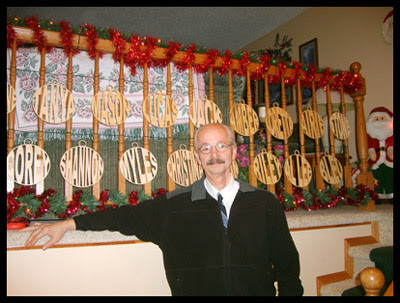 He wanted to share a tip that he made ornaments with up to 9 letters using this process. I think I said in the video that 5 letters or less worked better. As you can see by Sergios photos above they look great with more letters using ovals. My name is Pat from, North Dakota. I am 51 years old and am married to a lovely woman Darlene for 24 years. We have 2 daughters and one son and 6 grand children. I have always loved woodworking but scrollsawing took hold of me and won't let go. I love it passionately and do what ever I can to learn as much about it as I can and I can't tell you what an inspiration you are for me. I am not nearly as computer literate as you appear to be but I must tell you about this as I am very proud of what I have done. First of all I am very new to the art of scroll sawing (just about 3 months) and have literally become a fanatic for it. I spend every waking moment thinking about it in some way or another. I have joined SAW. I have subscribed to Scrollsaw Woodworking and Crafts and literally can't wait for each new issue. I have your blogspot saved to my favorites and check it literally several times a day for anything new. I have seen all your videos at least once. I have most of your patterns printed out and have studied Corel Draw through your tutorials. Unfortunately I only have Corel Draw 8.0 so you can imagine what I had to go thru to accomplish what you teach in your tutorials in order to make 8.0 do what your Corel can do. But I succeeded. 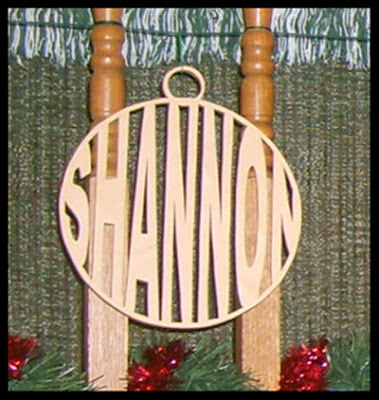 As you can see by the photo I have made a name ornament for myself, my wife, all our kids, their spouses, all their kids, and all the animals in the family (two dogs and my son's ferret). Also one of my wife's brother and her mother. 16 in all. My wife loves the project as does every one else that has seen it. I can't thank you enough for what you and the scrolling world has done for me. I have the Dewalt 788 on order and am using the Delta 16 inch currently which is working just fine but want the larger more vibration free unit. I will continue to send you photos of some of the other projects of yours that I complete. I'm currently working on developing my own blogspot and will inform you about it when I have enough to launch it. Thank you so much for giving me the gift of scroll sawing. I will (I apologize for not doing so yet) send you a donation for your blog spot as it has done so much for me. Steve Good you have given me a hobby that I will cherish till I die and I sincerely thank you for that. May all the best come to you and yours for the new year. God bless. Thanks Pat. Your email has made the first day of 2008 a little brighter for me. The scroll saw is just another tool. Put that tool in the hands of someone with a passion and special things happen. 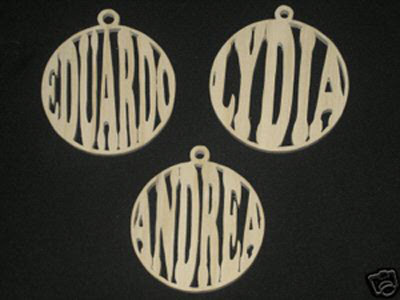 The ornaments you made for your family will be cherished for years to come. I'm happy you have found a hobby that you are passionate about and that I could help in some small way. Cutting accurate circles can be a challenge for new scrollers. You seem to have mastered that with little problem. You got a bunch of practice with all those ornaments. Thanks for sending the picture. Keep in touch and let us know how you progress with you new saw. Here is a portrait of a gaggle of geese. This is a common sight around the farm lands of Kentucky. I love watching these large birds come in to the ponds around here and sit down so gracefully. Use nice contrasting woods to make sure the portrait stands out from the background. The backer board is 8" x 10". You can reduce or enlarge the pattern to suit.